Although the central purpose of the first AICC conclave after the formation of the Congress-led UPA government, was to showcase the Nehru-Gandhi legacy, it also conveyed a strong political message both to the party cadres and its allies. While Dr Manmohan Singh had a special word of thanks for the UPA partners for joining them in the battle for secularism and social justice, the political resolution sent out a veiled message to its allies by asking them to adopt a spirit of accommodation because an alternative to the UPA may be ‘‘disastrous’’. The Congress also launched a searing attack against the divisive and communal ideology propagated by the BJP-RSS, and positioned itself as the party for the rural poor, khet mazdoor and the weaker sections of society. While speakers, including Prime Minister Manmohan Singh, used the occasion to hail Ms Sonia Gandhi's supreme sacrifice in declining the Prime Minister's post, both the Congress president and Dr Manmohan Singh sought to define their respective roles since the Congress, after many years, is faced with a new experience of having two different persons holding the posts of party president and Prime Minister. After Human Resource Development Minister Arjun Singh's recent public attack against the RSS, there had been some speculation that the party would fight shy of taking a belligerent stand on this issue. On the contrary, the political resolution and Ms Gandhi's speech contained an open attack against the BJP which she said, was blinded by arrogance and lust for power and even today had failed to accept its rejection by the people. Differentiating between the Congress and RSS-BJP, Ms Gandhi said their party believed in an inclusive, democratic and secular polity while the opponents’ ideology was based on communalism and religious fundamentalism. ‘‘There can be no let up in our battle against such forces,’’ she declared while the political resolution assailed the BJP for distorting history and resolved to correct it with single-minded devotion. Although Dr Manmohan Singh did not name the BJP or the RSS in his speech, he spoke of reversing the ‘‘ideological and bureaucratic onslaught on education’’ which, he said, was one of the major damages inflicted by the previous government.’’ Quoting Jawaharlal Nehru, he said, the Congress had always stood for liberal values and principles. While spelling out the party's future agenda and the tasks before the cadres, particularly in view of the coming five Assembly elections, Ms Gandhi's well-crafted speech also dwelt at length on the need for greater dialogue and strengthening relations between the government and the party. She asked Congress representatives in the Central and state governments to be more sensitive to the needs of the party organisation and not to forget that the government derived its strength from the party. The Prime Minister also sought to clarify the roles of the government, the party and the National Advisory Council (NAC), headed by Ms Sonia Gandhi. Congress workers, according to him, can contribute to the success of the UPA government by mobilising party cadres at every level for greater interaction between the government and the people. The NAC, he explained, is a bridge between the government and civil society. Both Congress president Sonia Gandhi Prime Minister Manmohan Singh had a word of praise for each other today. In her opening remarks at the AICC meeting, Ms Sonia Gandhi pointed out that in Dr Manmohan Singh, India had a Prime Minister of ‘‘great learning, vast administrative experience and impeccable reputation.’’ While urging everybody to extend full support to him, Ms Gandhi said she was aware that many Congress workers expected her to be Prime Minister but was glad that they had accepted her decision. ‘‘It was a decision that came from the heart,’’ she added. 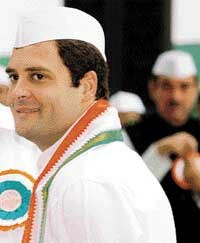 If former Prime Minister Rajiv Gandhi and Congress President Sonia Gandhi were the subject of unabashed adulation at today’s AICC meeting, it was the newest family entrant into politics, Rahul Gandhi, who was greeted with the loudest cheers and most passionate slogans. Ms Priyanka Gandhi Vadra, who was invited to the AICC meeting, did not show up. The venue, though, was plastered with her posters. With the Congress party’s first family dominating the proceedings, Prime Minister Manmohan Singh appeared to be an incidental presence on the occasion. The fifth-generation member of the Nehru-Gandhi dynasty and the Congress heir apparent was the cynosure of all eyes from the moment he entered the Talkatora Stadium, renamed as Rajiv Gandhi Nagar for today’s AICC conclave. Shortly after the proceedings got underway, there was a demand from the delegates that “our future leader Rahul Gandhi” be seated on the dais. AICC general secretary Janardan Dwivedi, who was conducting the proceedings, went up to Rahul and asked him to accede to the vociferous demand from the floor. The young Gandhi, however, declined though he did get up to wave to the delegates. That appeared to satisfy the Congress workers but not for long. This demand resurfaced with renewed vigour a few hours later when AICC functionary Anand Sharma was making his speech on the resolutions. This time there was no stopping the delegates who all rose in unison to press their demand. Rahul declined again but this time AICC general secretary Ambika Soni asked him to come to the dais in view of the prevailing mood. Rahul then came on to the stage, sat next to his mother for about five minutes, exchanged a few notes with her and then quietly slipped away. Though there was also a demand that he make a speech, Rahul did not do so. Although Rahul Gandhi was the day’s winner, the AICC conclave did not loose sight of the fact that the meeting was dedicated to Rajiv Gandhi on his 60th birth anniversary. Similalry, Congress President Sonia Gandhi’s leadership, her tireless campaign against BJP-led NDA, her her role in bringing together anti-BJP forces and her renunciation of the top job were also placed on record in a special resolution, moved by Andhra Pradesh Chief Minister Y.S. Rajashekhara Reddy. The tone was set by Congress President Sonia Gandhi who recalled Rajiv Gandhi’s various accomplishments in her opening remarks while Prime Minister Manmohan Singh in his tribute said Rajiv Gandhi’s achievements continued to inspire the party. An emotional Water Resources Minister Priyaranjan Dasmunshi, who moved the special resolution on Rajiv Gandhi, described the Nehru-Gandhi family not as a mere family but as a “movement” and a symbol of the unity of the country. Another resolution on Rajiv Gandhi’s dream programme of strengthening panchayati raj institutions, moved by Panchayati Raj Minister Mani Shankar Aiyer, provided another opportunity to extol the slain leader’s initiatives as Prime Minister.